Your woman looked me with a smile in her eyes. I knew I was in trouble. Her smile didn’t go as far as her lips. ‘How come I didn’t feature in your blog about all the good cooks?’ she asked. take him under her notice. She didn’t even ignore him. ‘You’ I said like a man who knows his place in the scheme of things. ushered your man out of the room. We were in the Sevastapol Street office. ‘Your tuna sandwiches are the best I’ve ever eaten’ I said. let me make clear that they are. The best that is. Unless you’re a tuna. ‘That’s not me. That’s your man’ I said. ‘He is the host’. ‘It’s in your office’ your woman pointed out, not unreasonably. ‘Let me have a word with him?’ I grovelled. ‘Don’t think you’ll get around me as easily as that’ she retorted. ‘Are you making any tea?’ she continued. woman. On the contrary when it comes from a woman it is a direct order. obeyed. I went and made your woman her tea. getting their ways. He disapproved of my approach. He didn’t laugh with me. ‘Well that explains it’ I said. game. Waterford will be hard to beat but the Saffrons are no mean team. to them all. Aontroim Abú. 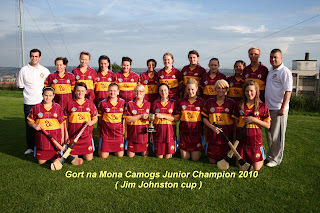 Update on the Camogie game directly from Croke Park where this blog is esconsed in the Hogan Stand. It is a draw. Aontroim camógs played brilliantly. A credit to our county. Na Camógs abu!